Give your guests a sweet place to set their tea bags with our Swee-Tea tea bag caddy. This cleverly-designed white ceramic caddy is shaped like a teapot and has the words "swee-tea" written in black. Each caddy measures 2 3/8" by 3 1/2" by 1"
Comes individually packaged in a black and white gift box with clear top, black and white polka-dot ribbon and teapot-shaped "For You" tag. 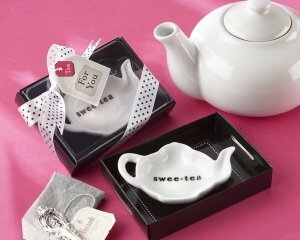 Is there room in the box to insert a personalized tea bag in the 'Swee-Tea' Ceramic Tea Bag Caddy? These are just the right size to hold an actual tea bag (as shown in the main image); they will not hold our personalized tea packets found by clicking here.